This blog was initially going to be about food. OK, truthfully, it was going to be about chocolate, hot chocolate to be precise. In spite of embracing a broader format, I suspect much of what I write will be about food. Our good friend Rebecca is one of the vendors. Here’s a picture of some of her beautiful vegetables. 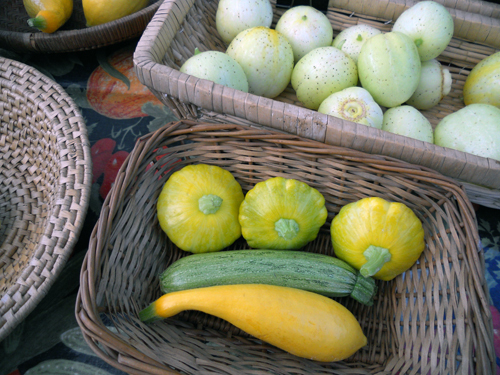 Lemon cucumbers and baby summer squashes from Rebecca's Garden. Sometimes on Fridays I help her harvest at her beautiful garden. I bought two lovely bunches of lavender from another farmer. The market was at its most abundant right now. 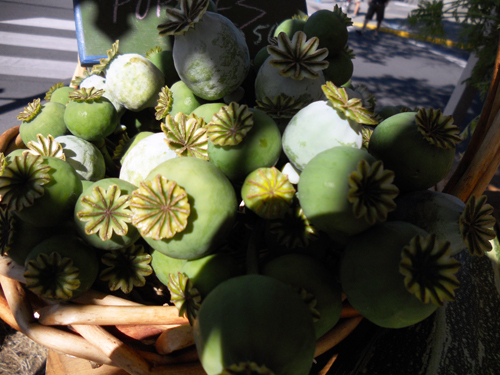 Below is a photo of some poppy heads. I’d never seen them for sale before. We also bought ten pounds of blueberries as it was Ruby Red Farms’ last market of the season. Beautiful bunches of poppy seed heads. they were a tall variety apparently; reds and pinks.